Looking for a sign that you need some help with your marketing? Or that I'm the right coach to work with right now? Or that you're really ready this time to do something about getting the clients you want or dealing with your marketing challenges in a way that takes the struggle out of your life? If you're here, all signs point to YES. Now put down my Magic 8 Ball and DO something about! Need another sign? 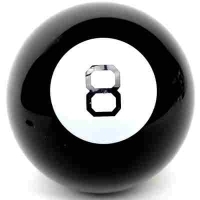 Ask the 8 Ball...seriously, just click on the ball for guidance.